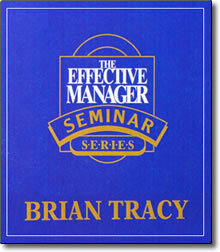 Effective Manager DVD Seminar Series – Discount! This comprehensive series consists of 14 complete, self-contained multimedia sessions. Each includes a one-hour DVD video program, 2 audio CDs (based on the video content) and 2 PDF workbook CD-Rom discs. These duplicate copies of the audio CDs and CD-ROM Workbooks are to be distributed among your employees. With everyone learning the same strategies, you’ll maximize the results of this program! Perfect for training employees and managers, the series is packed with thousands of profitable strategies to help business owners and managers cut costs, increase sales and dramatically improve profits through an effective business strategy. Your company may not have all the money in the world, but you can still have the best training in the world.